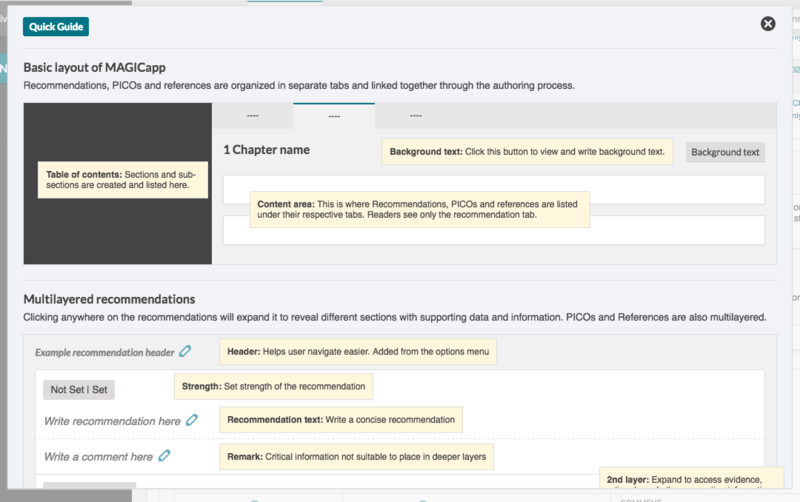 MAGICapp offers a variety of support options, including context-based online help, a documentation library with detailed procedures and troubleshooting tips, a guideline development checklist for guideline admins, and assistance from our support staff. For methodological support we link to the GRADE handbook, the GRADE JCE series, and we have implemented tooltip-help based on these. If you are in need of a methodologist to be directly involved in the guideline work we can bring your request to our collaborators in the GRADE community. Tooltips and info boxes: There are tooltips and info boxes with GRADE and methodology help throughout the application. Milestone and check-list feature: All guidelines have a Milestone and Check-list feature accessible from the guideline settings. The administrators of a guideline can use this to plan and follow standard steps of evidence based guideline development. The Feedback and help site is your central repository of information about all things using MAGICapp. In addition to documentation resources, the Feedback and FAQ site includes information about upcoming features, feature requests and support tickets. You are on that site now. To get to the Feedback and FAQ site from within MAGICapp: click on Help or Feedback in the top title bar. 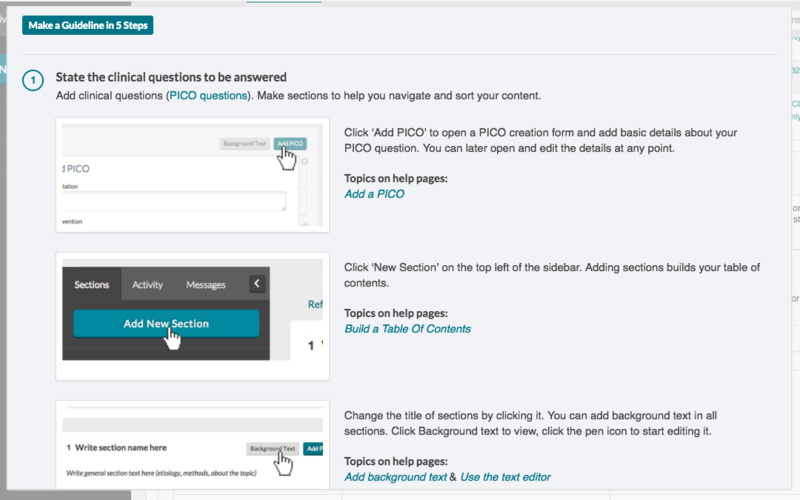 On the Feedback and FAQ site (this site) you can search for information about using MAGICapp or select overall documentation topics like: Writing guideline content, The guideline process, Technical stuff. You have the possibility to file a support request (called 'support tickets'), by clicking 'Contact support' in the right hand menu. This is available from anywhere on this feedback and help site. After clicking "contact support" you will then be given the opportunity to send us an email describing your problem. We will reply to your request as fast as we can, usually within 2 business days. How fast we will solve your problem however, depends on the complexity of the problem. We kindly ask you to search for an answer in our FAQ before filing a support request, as we have limited resources and want to spend them on improving the MAGICapp features, not writing emails.